From its beginnings, philosophy's language, concepts and imaginative growth have been heavily influenced by poetry and poets. 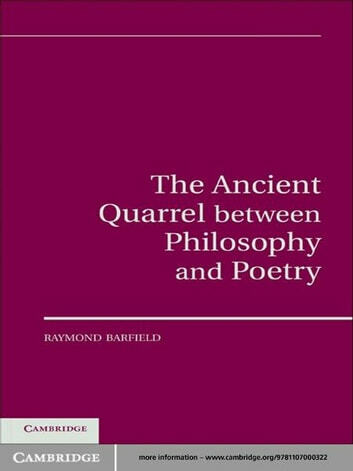 Drawing on the work of a wide range of thinkers throughout the history of Western philosophy, Raymond Barfield explores the pervasiveness of poetry's impact on philosophy and, conversely, how philosophy has sometimes resisted or denied poetry's influence. Although some thinkers, like Giambatista Vico and Nietzsche, praised the wisdom of poets, and saw poetry and philosophy as mutually beneficial pursuits, others resented, diminished or eliminated the importance of poetry in philosophy. Beginning with the famous passage in Plato's Republic in which Socrates exiles the poets from the city, this book traces the history of the ancient quarrel between philosophy and poetry through the works of thinkers in the Western tradition ranging from Plato to the work of the contemporary thinker Mikhail Bakhtin.